Essick Auction Service, LLC is a full service auction company. 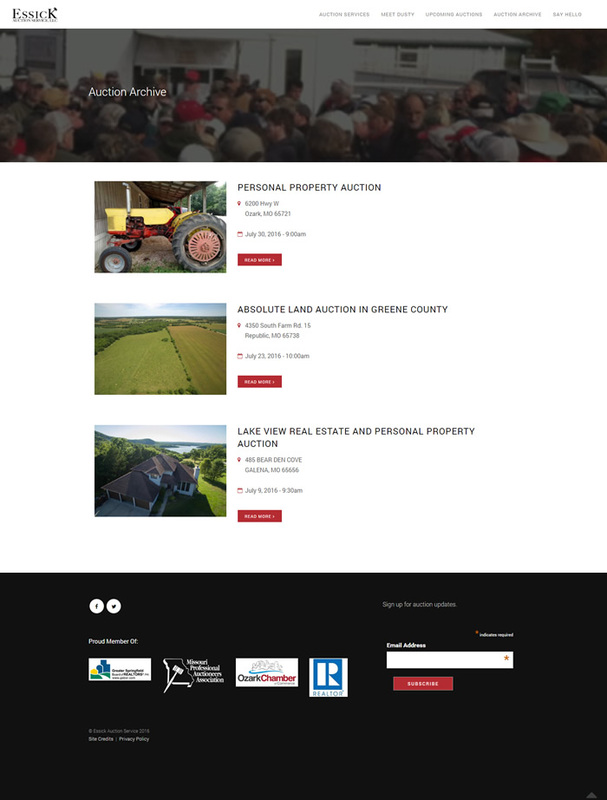 Whether it's livestock, real estate, farm equipment, antiques, business liquidations, etc they have you covered. Auctioneering has been a tradition for this family since 1945. This site is the 2nd of 2 sites built for the Essick family. One of the main purposes of the site is to promote upcoming auctions. Using the user interface, new auction notices can be easily created and images of auction items can be bulk uploaded. Upcoming auctions are automatically featured on the home page and thumbnails of featured items are automatically displayed in the site footer. We have 2 businesses and Web Marketing Services hosts both our websites. We have been very pleased with our websites from the design, hosting, education, recommendations for SEO and much more! Del does a great job and has lots of patience when it comes to training us on how to update our own website because this side of the business is not our strong suite! He has made our sites very user friendly and we have had many compliments on our websites as well as an increase in site traffic! We would highly recommend Web Marketing Services for any of your website needs!